As one of the best contact hitters of his era, George Sisler recorded two of the greatest hitting seasons ever seen in baseball. While he didn't appear in many of the iconic pre-war sets, he still has plenty of notable cards to track down, with his first cards coming in 1916. Review some of the best George Sisler baseball cards with several from candy-based sets issued during the 1920s. Sisler was the top bat the beleaguered St. Louis Browns franchise ever had and he served as the team's rock at first base for 12 of his 15 seasons. Two years in Sisler's career put him on a different level compared to other hitters as he set a pair of impressive records. In 1920, Sisler smacked 257 hits in a single season, a record that stood until 2004 when Ichiro Suzuki hit 262. Sisler's American League MVP season in 1922 was even better as he hit .420 and notched at least one hit in 41 consecutive games. That record would eventually fall to Joe DiMaggio in 1941, two years after Sisler and his rival Lou Gehrig entered the Hall of Fame together in 1939. 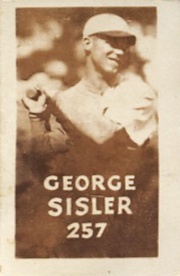 Shop for George Sisler Baseball Cards on eBay. Although this list focuses specifically on baseball cards from 1948 and earlier, "Gentleman George" also appears in more modern sets. 1960 Fleer shows him wearing the jersey of the Boston Braves during the last years of his career. In addition, Sisler and Hall of Famer Pie Traynor share a checklist card in 1961 Fleer Baseball Greats. Pushing further along, 1979 Topps combines Sisler and Ty Cobb on an All-Time Record Holders card. Bringing us to the current period of collecting, Sisler and Ichiro were included on a Legendary Lineage insert in 2010 Topps. Meanwhile, 2014 Panini National Treasures teams Sisler with Cobb and Tris Speaker for a memorable triple bat relic. George Sisler was one of the greatest players of his day, but he lived in the shadow of Lou Gehrig at first base and his amazing statistics couldn't quite keep up with Ty Cobb. This makes trading cards from his playing days more accessible to those looking to build a tobacco-era Hall of Fame collection. While card value was the key component used in forming this list, the design and historical significance of each set was also considered. Click on the card titles or images to shop for specific cards on eBay. Linked sets in the descriptions go straight to detailed profiles. Once a promising pitcher, Sisler is featured throwing and batting in 1922 E122 American Caramel. 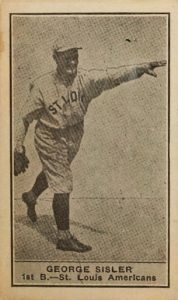 Like many elite hitters, Sisler threw and hit left-handed. Ultimately, it was his batting skills that won out, so he was moved permanently to the infield by the Browns. The '22 set is very similar to 1921 except for a slightly smaller card size and lower quality photographs. You wouldn't know it by looking at the front, but Sisler is the subject of this 1925 Turf Cigarettes tobacco card. The reverse side lets you know it is "Gorgeous George" at the plate in the middle of his swing. Sisler is featured because his .420 batting average in 1922 set the American League record. He is actually the only baseball subject in a 50-card set about sports records. The wide-reaching multi-sport set also includes cricket, billiards and rugby. 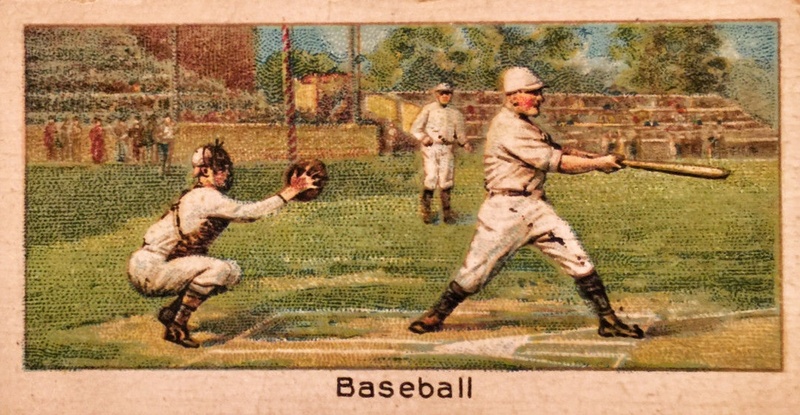 The type of cards that make up 1921 W551 are known as a "strip set" as they came attached in a long strip. The colorful drawn cards also bring to mind the idea of a comic strip, as well. Offering some of the best to play the game, the ten-card set includes Sisler, Walter Johnson and Babe Ruth. W551 also features one of the few player cards for future Hall of Fame manager Casey Stengel. 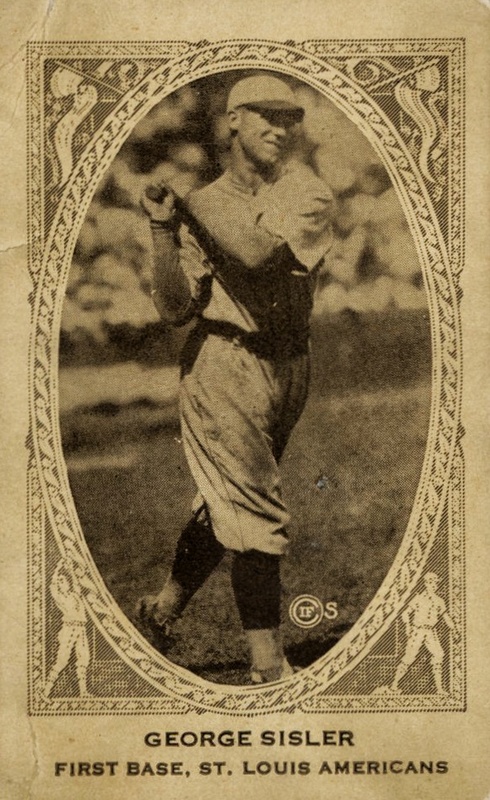 American Caramel issued many memorable sets during the 1920s, including four appearances on this top list. 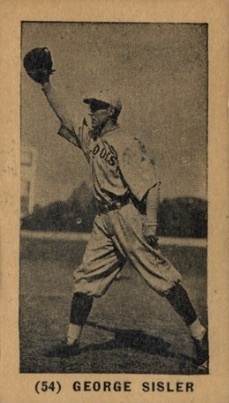 The 1927 set, known as the "Series of 60," was their last baseball card issue. For their final set, American Caramel added card numbering, and Sisler, who was shown as "Geo. R. Sisler," is card #49 on the checklist. Sisler would later play for the Washington Senators and Boston Braves before retiring in 1930. While tobacco and gum products would continue for many years, 1927 E210 York Caramel was one of the final sets given away with caramel candy. The E210 cards can be divided into Type 1 and Type 2 based on how the lettering on the reverse side is placed and the card's finish. Type 1 has a dull finish and the text faces left while Type 2 has a glossy finish and the text faces right. On his card, Sisler is shown awaiting a throw to first base with his foot on the bag. After a six-year hiatus from offering baseball cards with their candies, American Caramel returned in 1921 with a set known as the "Series of 80." Sisler has a batting and throwing card and both have roughly the same value with collectors. 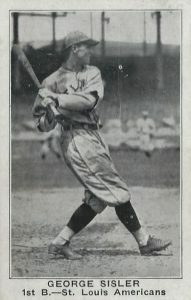 As you can see on his card, Sisler utilized a unique grip while hitting where he would choke way up on the bat, allowing him to swing faster at a pitch. The 1921 Exhibits photo card set was the first one issued by the Exhibit Supply Company. With four players from each team on the checklist, the release was designed to entice as many fans as possible to purchase cards. Exhibits sets from later years are sometimes hard to differentiate but you'll know that you have a 1921 example in your hands if it includes the abbreviation "AM.L." for American League, which is unique to this set. 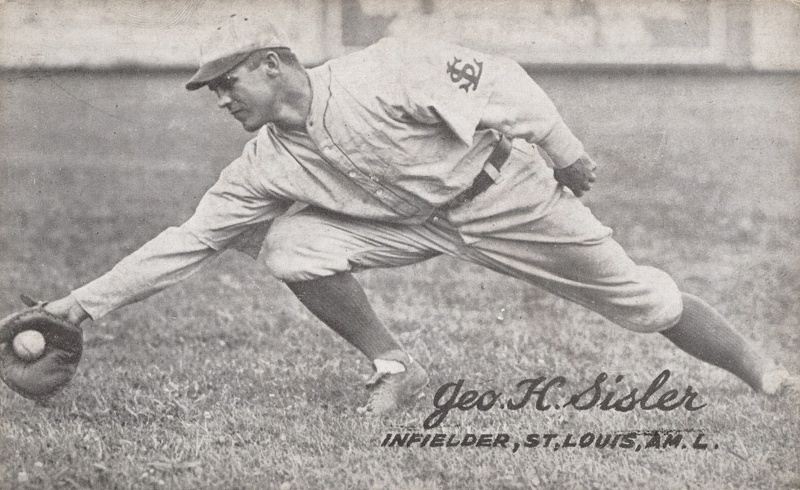 Sisler is featured on a horizontal card as he reaches for a grounder with the St. Louis Browns logo visible on his left shoulder. Sisler was one of the few baseball players featured in the 1948 Topps Magic Photos set whose 252-card checklist is made up of mainly boxers. In total, there were 19 baseball players featured in the larger set and those were the first baseball cards issued by the candy maker. 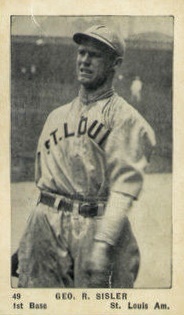 Sisler's card image, which could be seen by adding liquid to the initially blank card, features "257" broadly across the front, honoring his single-season hit record. Along with 1948 Topps, the only other card on the list outside of the 1920s is Sisler's appearance in the black-and-white 1940 Play Ball set. 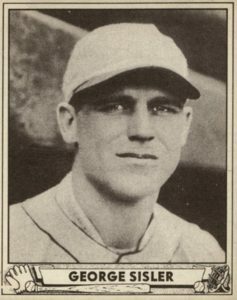 After the set's success in 1939, the 1940 edition had an expanded checklist with several retired players featured, including Sisler, who had been out of the league since 1930. The '40 set added a frame around the players photo, a change from 1939 which featured simple white borders. 1922 E120 was issued by American Caramel Company along with sticks of their candy. The set has become famous for its intricate border design which frames each player's photograph beautifully. 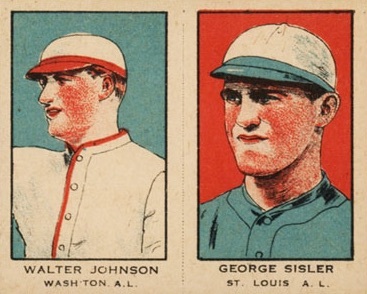 American League players are featured on a cream-colored stock (like Sisler) while National League players have a bluish-green paper. A team checklist is provided on the back of each card. Overall, the 240-card set was one of the most robust of its day. 1916 Big Head Baseball Strip Card PSA Graded George Sisler HOF Tough! 1950 CALLAHAN GEORGE SISLER "SISLER TODAY IS" PSA 9 MINT CENTERED HOF'ER! 1950 CALLAHAN GEORGE SISLER "SISLER WAS" PSA 8! LASER SHARP! RAREST VARIATION!